This Program is dedicated in loving memory of Scott A. Torroll, who was known and loved by many as Humudce in the Everquest community. Read the updates section down at the bottom for the list of updated features. THERE IS NOT A VIRUS/TROJAN IN THIS FILE. If your antivirus detects one please report it to them so they can fix thier software. It is a false positive. see this thread for more info. This is split up into different sections and the main subsetions of each are underlined and in bold. each section is split up by a series of dashes "-". Hopefully this will make it easier to find what you are looking for. 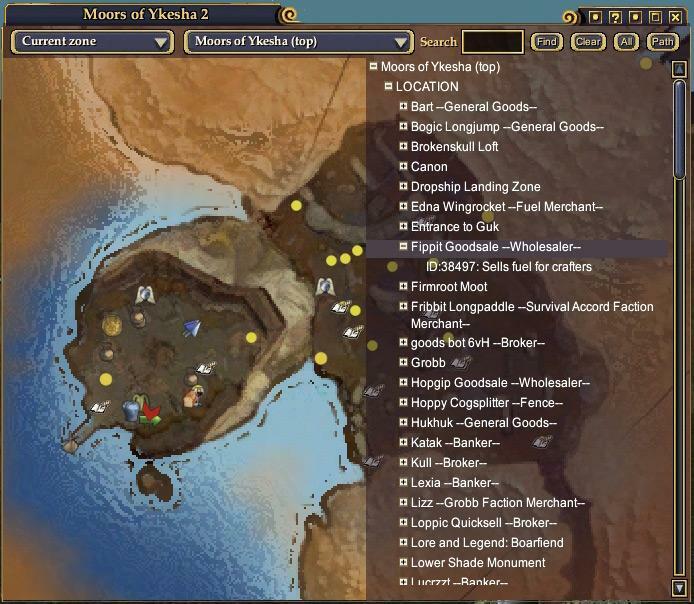 This Keeps your EQ2MAP mod up to date, when ever new zones or points of interest are submitted on the EQ2MAP Website, this will update them for you automaticly. 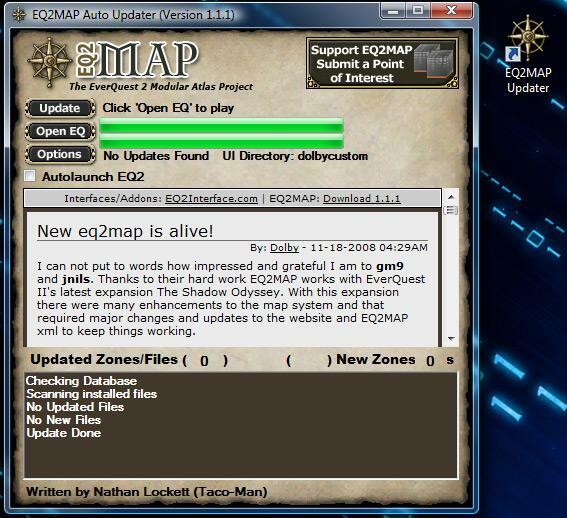 A previous installation of EQ2MAP is not necessary however using this program in a directory that has EQ2MAP already installed should work as well. The Microsoft .Net Framework 2.0 can be downloaded either from this direct download link or if you prefer you can get it from windows update. When you try and run the program and you get "The application failed to initialize properly (0xc0000135). Click on OK to terminate the application." or something similar it is because you either dont have the .net framework, or you have the .net framework but it not 2.0 or greater. If you don't have an eq2.ini file you DO NOT need to make one, it will create one for you. 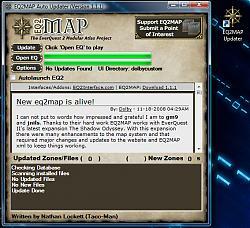 Run the EQ2MAP_Updater_Setup.exe file to install the program. Run the program. If you are having installation problems please re-read the instructions including the before installing instructions. 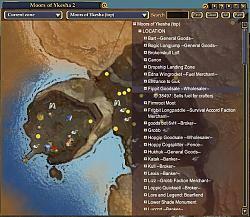 If you are experiencing problems, or need installation help please post on the Troubleshooting forum for EQ2MAP. If you have a suggestions, comments or a feature request for the updater post it on the Official EQ2MAP Updater Thread, chances are if you have an idea you think may be usefull there are probably many other people who would find it usefull as well, if your idea is possible i will do my best to add it in. Update on open: If checked, the updater will start scanning for updates as soon as it is opened. Everquest 2 Directory: The Everquest 2 directory is used so the updater knows where to download the files to. To change it click the Browse Button to the right of the path. Autolaunch EQ2: If checked, the updater will launch this file once it is done downloading all the updates(if it is unchecked, it will be launched when the open eq button is clicked). To change this file click the Browse Button to the right of the path/filename. UI Directory: You can use this drop down menu to select the ui directory to download updates to. When changed it will also modify your eq2.ini file to use this directory as well(so that it will be the one used when eq2 is opened). Quick scan: If checked it will skip the file scan if no new database is available.This is only done if you use Auto Update. It will scan if you press Update button. Log Updates to EQ2MAP_logfile.txt:when this set it keeps a record of what files were updated and new files that were downloaded, it includes a time stamp and keeps adding to the file "EQ2MAP_logfile.txt" which is located in the directory you installed the updater (usually C:\Program Files\EQ2MAP Updater) You can use the Show button to open the log file in your default text viewer. Re-Download ALL Files:When this button is pushed the updater will redownload ALL of the files and will NOT ask for confirmation about overwriting any. ONLY USE THIS when the eq2map mod is working improperly. YOU WILL LOSE all custom skinns and icons when you use this!!! Once the program is open it should start scanning files to check for updates and then download any updates that are available. Once it is finished updating if there were no errors it will have update complete written and it should open everquest in 5 seconds if "AutoLaunch EQ2" is checked. If its not you may open eq2 by pressing the "open eq" button which is located below the "update" button. While Most all of these functions can now be performed much easier by the updater through the options menu, some have been left for anyone who still wants to use them. /testserver: this makes the updater update and auto launch from the test server by setting the language to TestServer and then autolaunching the correct eq2 test server file. However a shortcut with this should already be in the eq2map folder of the start menu it is name "EQ2MAP Updater - Update Test Server"
/setupdatefolder: ONLY USE THIS if you dont have eq2 installed on the computer you are updating from, if eq2 is installed on the computer you are updating from use /seteq2dir. The /setupdatefolder lets you choose any folder to update to if you dont have eq2 installed on the computer you are running the updater from. What the heck is a command line argument and how do i "set/use" them? After creating a Windows Shortcut to the updater, right-click on the Shortcut's Icon and click 'Properties' in the resulting popup menu. Click the 'Shortcut' Tab on the Properties Window that appears. Click 'OK' on the Properties Window. Now when you start the updater using this particular Shortcut, whatever options you added will be used. - If your eq2.ini file isnt set up properly, the updater will try and correct it, but in some cases it may not work. If you just delete the eq2.ini file and run the updater it will create a new one for you that is set up properly. -Found a major bugg in Versioncheck code that prevented the information window from showing properly. -Have changed some compiler settings to try to fix a Windows 7 issue. -If the window is moved of screen it will center on screen next time it starts. This is to prevent invisible windows. -Changed Testserver working directory, was set to wrong path. -Options now displays Testserver as a Language , was an error in code that prevented that. -If you set a Launch File 2 , the checkbox was not enabled until you re-open Options window. -If you enable Launch File 2 it stays enabled now. -Added more search paths for installations. -Fixed an error with TestServer installations , LaunchPad should now work. -Redone the installaton selector again, it only suports Launchpad.exe now. You can still set your own program but Launchpad.exe is default. -Made a new installation selector to make it easyer to find a EQ2 installation. -Rebuild the way the program saves it settings, should no longer need access to program folder. This required a major rewrite of the Options window, there could be some buggs. -Added support for a IgnoreList. Now UI Modders can specify what files the Updater should not update. See info below how to create the IgnoreFile. A missing file will still be downloaded even if its on the IgnoreList. -Minor chages to code to clean it up. -Some text changed to clarify. -Fixed a bug that could break the updater if the computer had the wrong date set. -Added tooltip to Version window. -The installer now clears the cache to prevent errors with new versions. -Found a bug that downloaded the database twice. -VersionHistory was loaded even if it don't show. -Changed code to display Version check message properly. -Added a Message that informs the user if the old map system is in use. -Added support for compressed files. -Added a version reminder that informs and forces users to update if neccesary. -Some minor changes related to this. -Added a Start Delay selector in Options, some users has trouble if it opens a network connection to early. -Changed the downloader , hope some error reports now are fixed. -Changed code to support the new file structure of the New map system. -Cleaned up the MD5 code. -Added some support files for Vista, should make it easier to install. -Added a Quick Scan option, if there is no new database there is no need to scan the files. This option is only active when using auto Update not manual Update. -Cleaned up the log file for easier view. -Fixed an error that repeated map downloads caused by localization. - Added a retry to DB download. - Fixed a bug that reported an error even if it did work when retrying to download a file. - Added XP style buttons. - Added Tooltip to buttons. -- Added Show log button. -- Added a Clear Cache button. -- Added a warning message to Download All button. -Did some minor UI tweaks. -The Error message window now has a version string added. - Added some more status info. - Added more config file error handling to try to track down some reported errors. - Fixed a download bug that did lockup the program in some cases. - Added config file error handling to try to track down some reported errors. - Fixed some more bugs i found. - Inproved error handling while downloading. - Changed the delay until a file timesout to 15 sec. - The window will now change its size if you are runing non-standard dpi. - Added a .config file to prevent some errors. - Some minor tweaks to improve stability. - You can now press stop during database scan. - Some minor UI fixes. - It will now skip a file if it's read only. This way you can prevent the updater from updating custom files. - Added som more info. - The updater now retrys if a file fails to download. - Fixed some minor issues. - Added a status window for more information. - Fixed some more bugs. - Converted the source to VB 2005. - Added a cache for the database to reduce server load. If no new database exist it uses the cached one. - Separated download errors from program errors. - Cleaned up some code. -Added an option to send command line parameters to eq2 (or whatever your main autolaunch file is). This existed before however the only way to do it previously was by manually adding an new entry in the updaters config file. It is now a text box in the options window. -Fixed a bug that on very rare occasions caused the updater to not close when it should. -Added suport for the language folders I think its working well, but if there are any bugs please let me know, i couldnt really test it that well. -Added Drop down boxes for switching between diffent UI folders (it will update the eq2.ini as well) and also for switching between languages. -Error handling for unknown exceptions to help track down unusual bugs. - Updater should add a shortcut in its startmenu folder for more easily switching between the regular and test server. If you previously set your eq directory to the test folder directory change it to the main eq2 directory and then use this shortcut. - Updater now detects your eq2 directory the first time it is run and ask you to verify that it is correct and gives you the option to change it if it is not. - Updater will read your eq2.ini file and update in the appropriate folder. If no eq2.ini exists one will be created for you and it will use "EQ2MAP" as the folder for the custom interface directory. - Choosing the file to autolaunch is much easier than before, see entry for /setautolaunch in the command line arguments section. - Updater now has an installer, you can run it from wherever you want. -IMPORTANT BUGFIX! Window would not show up until after the update was done if auto-updating was enable(which it is by default).This fixes a problem introduced in 0.9f. I appologize for this and am sorry for any inconvenience it may have caused. I did not realize how stupid the vb .net can be sometimes. although this is still beta and this kind of thing is possible to happen i appologize again. - Program now starts checking for updates automatically when it is opened. If for some reason you don't want it to do this simply use the /noautoscan command line argument. - Small Modification made to the way it writes logs. It should now seperate each "section" by a blank line and should not write to the log file if there was nothing downloaded. - From now on the version number will be included in the program's "title bar"
- Black boxes around buttons should not show up now, even on the systems that were showing them before. You can add as may "File" lines as you need. Map Updater is now identifying as malware to every major anti virus, does eq2ui verify files anymore? I don't like the new update + map...it removed where everything was like mobs and shinies etc. I CANNOT for the life of me figure out how to download this map program, and yes, I'm a dumb woman who knows nothing about computers. I am having issues recently, with eq2maps not responding. It is very inconsistent, I was able to use it last night 7pm pst then today I can not get it to update. The updater goes from the 3 second count down then to Not responding. Looks live v1.2.10 is not compatible with Win8.1. When I rolled back to 1.2.9, the program properly installed and was able to run. Since you recently reinstalled the game, it's likely that the new patcher put the game into an unexpected place. Right-click the icon you use to start the game, then click "Open file location" on the pop-up menu and see if the location matches where you installed the map and custom interfaces. Having two game folders is very common with returning players. I'm also having this problem. I did as suggested here but it still doesn't want to stay on the Darqui folder when I select it in options. I ran into a post here about the updater version posted a few months ago. 1.2.10 was the last version put out, and that was some time ago. The person's post asked if there was going to be an updated one since it's been a long time, ie: does this one work sufficiently. I recently upgraded my PC and software, also using EQ2, and the EQ2Map in which I was asking myself the same question. It works fine as is, but there is that question still. Is there a need to do a program update anytime for any reason? Or is this version sufficient for some time to come. This is a really great program, I haven't played much in the last couple years due to RL concerns, but I've come back and this helps remind me where I am and where everything is. Is this program still current? Just noticing it hasn't received an update since 2012 I'm just coming back to the game and wondering if I should still download it. I just have to mention this because it bugs me. The named mob 'Rendclaw' in the Withered Lands is labeled wrong. He doesn't 'spawn when you approach the area'. Like other named mobs, he's either up or not.. but if he's UP, he's wandering that area stealthed. You can actually see him if you have a see stealth ability. He does not spawn when you approach. I just recently returned to EQ2 and had to reinstall everything including EQ2 maps and a new UI. I'm not sure what I missed, but I can't seem to get the maps working. 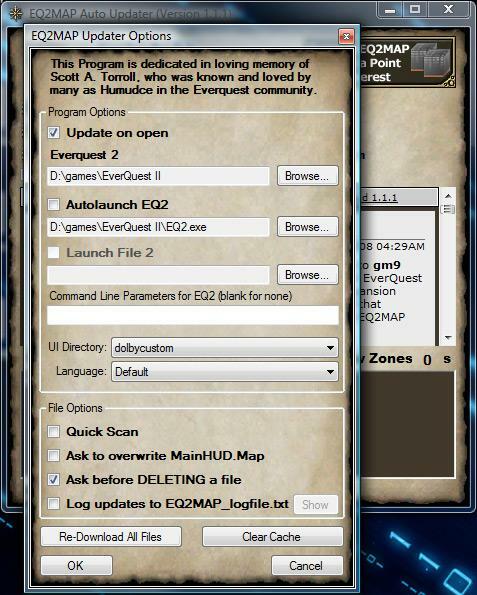 Everytime I point EQ2maps to my DarqUI folder, it keeps reverting to an EQ2Map folder. How do I fix this?